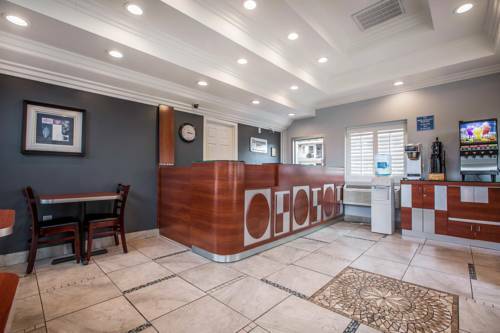 The Rodeway Inn near LEGOLAND hotel in Carlsbad, CA gives you an affordable place to stay you can rely on. Our smoke-free hotel is near LEGOLAND California theme park, Carlsbad State Beach, Carlsbad Premium Outlets and McClellan-Palomar Airport. Enjoy amenities that include free WiFi, free coffee, a seasonal outdoor pool, guest laundry, copy and fax services. Each fresh, clean guest room features a 40-inch LCD TV, refrigerator, microwave, coffee maker and hair dryer. Select rooms include a a hot tub. Also, earn rewards including free nights and gift cards with our Choice Privileges Rewards program. This is a pet-friendly hotel. This hotel is 100% smoke-free. Guests in this historic luxury hotel have reported ghost sightings in certain rooms.